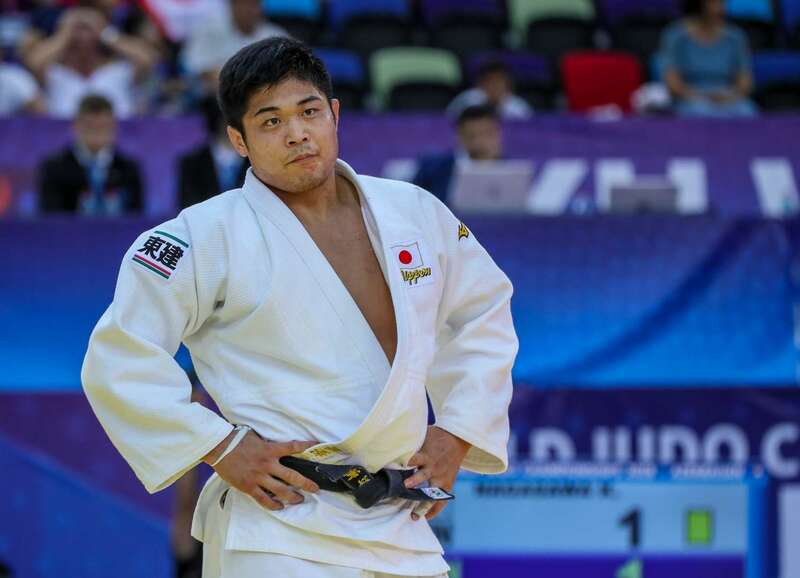 Japanese retains while Spanish makes history on day five as Japan maintained their incredible medal rush in Baku. All 13 Japanese judoka who have competed so far have medalled. 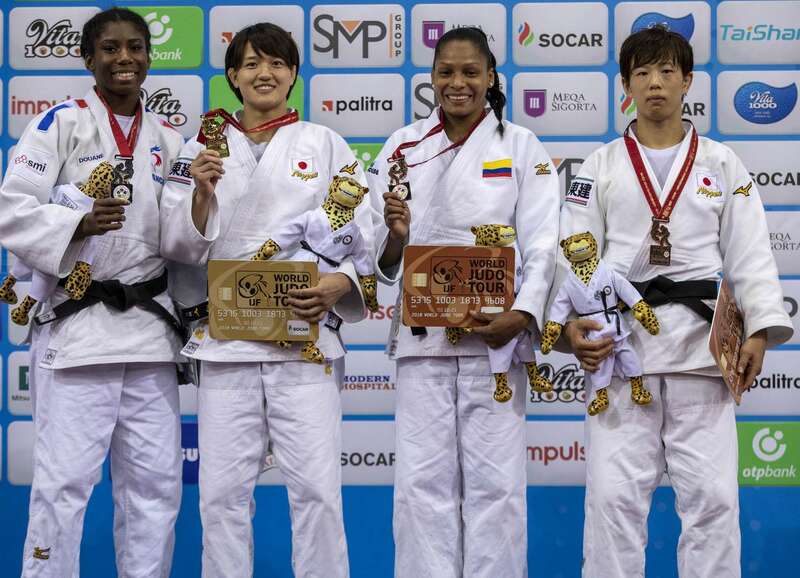 ARAI retains to win Japan’s fifth gold medal in Baku Four-time Grand Slam gold medallist ARAI Chizuru (JPN) successfully retained her world title and red backpatch by conquering four-time Grand Prix winner Marie Eve GAHIE (FRA) in the -70kg final. 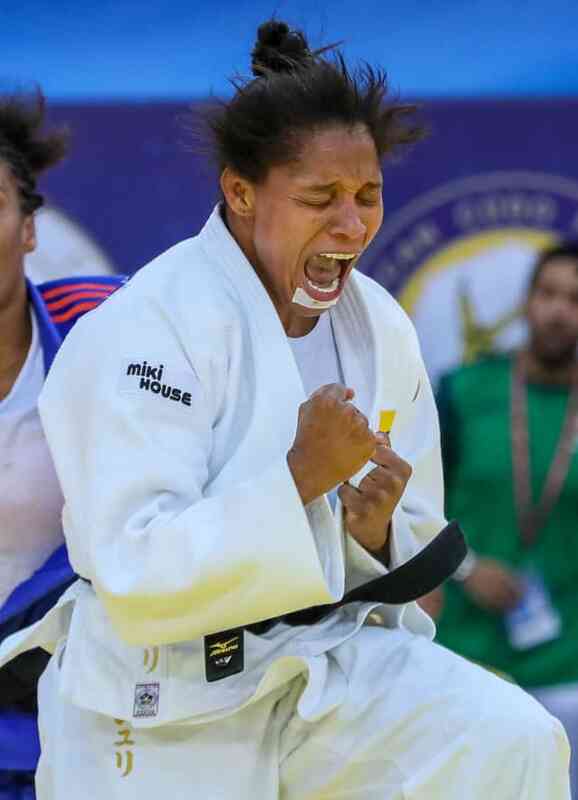 ARAI fell behind to a waza-ari from GAHIE who earned some comparisons to her golden teammate Clarisse AGBEGNENOU (FRA) for the powerful manner in which she progressed to the final. ARAI replied with an uchi-mata for a waza-ari score and followed up with the hold down to win gold. The Japanese used a tate-shiho-gatame hold to subdue the French fighter to claim her second world title and Japan’s fifth in Baku. In the first semi-final ARAI defeated world silver medallist Maria PEREZ (PUR) in a rematch of the 2017 final. PEREZ lacked her usual energy and ARAI increased her workrate as the contest went on and it paid off. 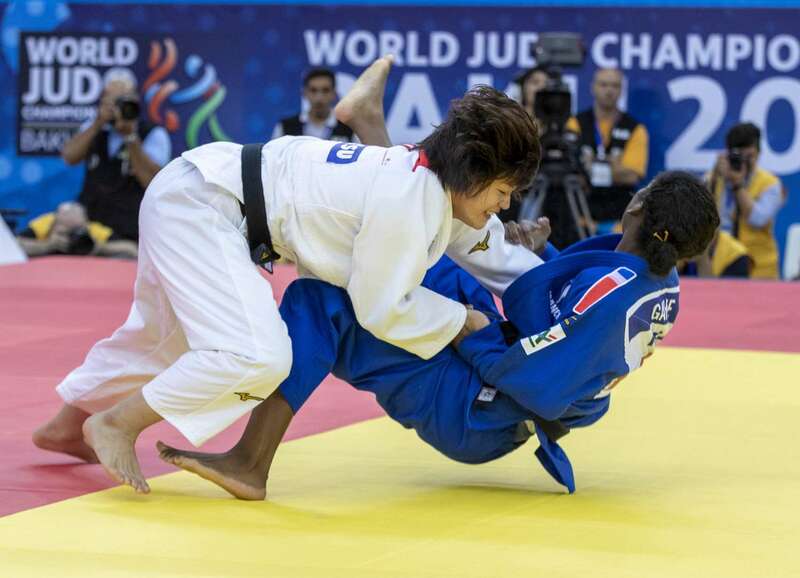 The world number six threw with her trademark uchi-mata for ippon with 56 seconds left to progress to the final and send PEREZ down into the bronze medal contest. In the second semi-final GAHIE showed a flavour of the new youthful generation who are beginning to make their presence felt on the world stage. The 21-year-old French judoka held down two-time Grand Prix winner Assmaa NIANG (MAR) with a mune-gatame for 20 seconds and ippon at the halfway point to add to France’s fast-rising medal tally. In the first bronze medal contest three-time world champion and double Olympic medallist Yuri ALVEAR (COL) beat NIANG to a place on the medal podium. The Colombian legend trailed to a waza-ari score from her African opponent but dually responded in the most emphatic way possible. ALVEAR, who was a shock winner of the 2009 World Championships, threw with an o-soto-gari for ippon to win an incredible sixth World Championships medal. In the second bronze medal contest ONO Yoko (JPN) made sure that Japan would provide 50% of the medallists in the -70kg category. ONO, who was well supported by the Komatsu company fans, earned her victory in golden score when PEREZ received her third a shido for a false attack. It was a toothless showing from the Puerto Rican in regulation time and golden score as she had clearly given everything in her five previous contests and could not keep up with her Japanese opponent. 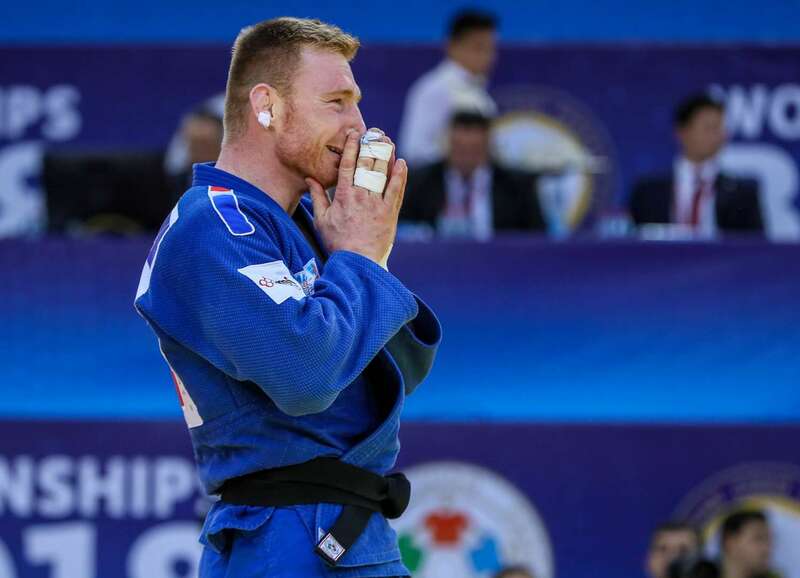 World number three Nikoloz SHERAZADISHVILI (ESP) made history for his country as he was crowned the first male judoka from Spain to win a senior world judo title. SHERAZADISHVILI defeated Budapest Grand Prix bronze medallist Ivan Felipe SILVA MORALES (CUB) to win gold in a compelling contest between the best two judoka in the category today. SILVA MORALES broke the deadlock with a waza-ari score but SHERAZADISHVILI restored the final to level terms with a waza-ari of his own. 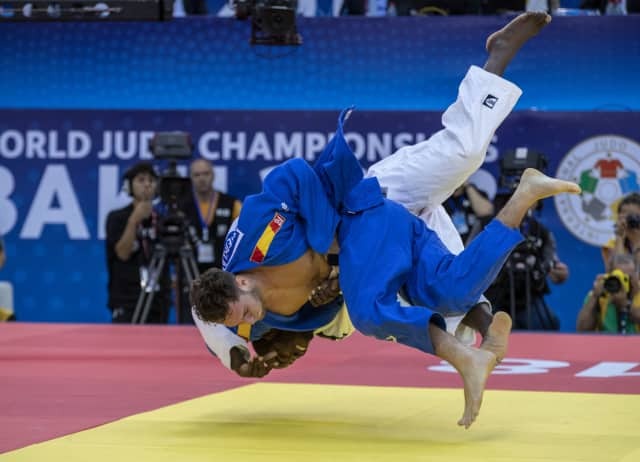 In golden score the Spaniard settled the destination of the -90kg title as he threw with an uchi-mata for gold. In the first semi-final SILVA MORALES defeated Axel CLERGET (FRA) after 90 seconds to guarantee Cuba their first medal in Baku. The classy Cuban threw the Frenchman with pure te-waza for ippon with a powerful display to move into the final at -90kg. In the second semi-final SHERAZADISHVILI bested former world silver medallist TOTH Krisztian (HUN). There was nothing to separate the former junior rivals who had an extreme size difference, with TOTH being one of the shortest in the category and the Spaniard being one of the tallest. After two minutes and 17 seconds of additional time, TOTH was caught with a tani-otoshi to end a highly-competetive contest. There was an incredible amount of respect between the two, as SHERAZADISHVILI gave a high five to his victim on the ground who responded in kind before they hugged and wished each other well in their respective medal contests. In the first bronze medal contest NAGASAWA Kenta (JPN) lost a lung-busting battle with TOTH which required four minutes of golden score. The Japanese led with a waza-ari score from a uchi-mata and elected to use up time on the ground. That tactic was anticipated from his Hungarian adversary who responsed with a ko-soto-gake to tie up the scores and send the contest in golden score. After three minutes and 43 seconds NAGASAWA took TOTH back and over for a match and medal-winning score. It was heartbreak for TOTH who took silver in 2014 and finished fifth at home in Budapest last year. 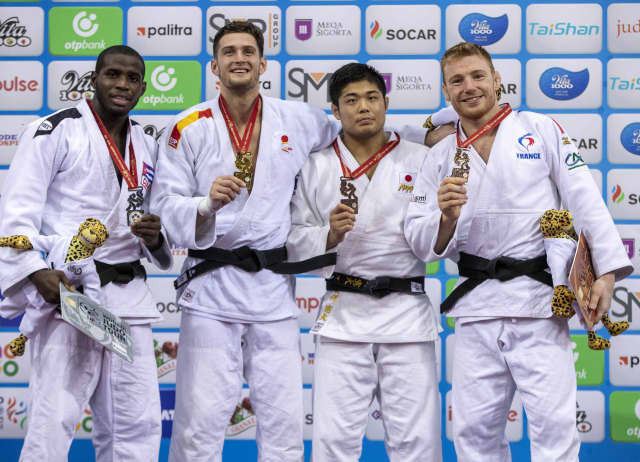 In the second bronze medal contest CLERGET defeated Paris Grand Slam bronze medallist Eduard TRIPPEL (GER) to earn his first World Championships medal. The Frenchman was fighting in his third Worlds while TRIPPEL was making his debut and both won plaudits in Baku. Only one could grace the podium and it was CLERGET who came from being a waza-ari down to submit the German with shime-waza. The world number 16 became the first Frenchman to medal in Baku with high hopes for them at -100kg on Tuesday.